Nasser, R. A., Mansour, M. M. A., Salem, M. Z. M., Ali, H. M., and Aref, I. M. (2017). "Mold invasion on the surface of wood/polypropylene composites produced from aqueous pretreated wood particles, Part 1: Date palm midrib," BioRes. 12(2), 4078-4092. The effect of particle pretreatments on the biodeterioration of wood-plastic composites (WPCs) was investigated. WPCs made from untreated and pretreated frond midrib particles of date palm were used. Before the addition of a coupling agent, the wood particles were pretreated or extracted with either cold or hot water and mixed with polypropylene to produce panels, which were then superficially inoculated with an ascomycete’s fungus Trichoderma harzianum T6776. The WPC surfaces were studied using scanning electron microscopy (SEM) and electron dispersive X-ray spectroscopy (EDX) measurements. In comparison with the control, an intensive growth of T. harzianum hyphae was found over the WPC surface manufactured from untreated date palm midrib particles with the colonies clearly visible. The pretreatments of date palm particles reduced the growth of T. harzianum in comparison with the control and untreated particles. The results suggested that particle pretreatments could be a suitable way to limit the growth of molds over WPC surfaces made from date palm midrib. Wood and wood-based products, such as building materials, are subject to exposure to indoor fungi contaminated environments, causing sick-building syndrome (SBS) or toxic-mold syndrome (Bush et al. 2006; Pettigrew et al. 2010). With a broad range of pH and temperature values, fungi easily grow when the moisture content of wood exceeds 60% (Viitanen and Ritschkoff 1991). Residues of date palm (Phoenix dactylifera L.) can be used for several industrial purposes, such as the production of particleboards (Hegazy and Aref 2010; Amirou et al. 2013), energy production (Nasser et al. 2016), pulp and paper (Khristova et al. 2005; Nasser et al. 2015), wood-cement composites (Nasser and Al-Mefarrej 2011), and wood-plastic composites (Abu-Sharkh and Hamid 2004; Aref et al. 2013; Nasser and Aref 2014). Wet or decomposed wood and wood-based products are susceptible to colonization by Trichoderma (Bech-Andersen and Elborne 2003; Nielsen et al. 2004; Mansour and Salem 2015). Trichoderma species have been shown to degrade pit membranes and increase the penetration of preservatives (Green et al. 1996), colonize sapwood of freshly felled pine woods (Butcher 1968; Dowding 1970) and heartwood of Scats pine poles (Bruce and King 1986), and degrade and colonize poly(3-hydroxybutyrate), a thermoplastic polymer composite (Râpă et al. 2014). Mycelia with white cottony green conidiation can be seen over the infected wood surfaces with T. harzianum (Shah et al. 2012). There are two major limitations that restrict the utilization of wood-plastic composites (WPCs) in several applications; the first problem is the poor compatibility between the wood and the plastic matrix, while the second one is the susceptibility of WPCs to attack through biodegradation agents, especially with an increase in woody materials and with a poor compounding process (Verhey et al. 2001). The first problem has been solved by using coupling agents to improve the compatibility between wood (polar, hydrophilic) and plastic (non-polar, hydrophobic) (Nasser and Al-Mefarrej 2011; Aref et al. 2013; Nasser and Aref 2014). To overcome the second problem, studies have been conducted by either using preservative formulation (Verhey and Laks 2002; Morton et al. 2003; Simonsen et al. 2004) or using wood species that have a high natural durability to biological attack (Pendleton et al. 2002; Simonsen et al. 2004; Kim et al. 2008; Fabiyi et al. 2011). The WPCs can be attacked by white and brown rot fungi that cause degradation of the main structure of the wood (Morris and Cooper 1998; Naumann et al. 2012; Catto et al. 2016). Several studies have mentioned that wood and WPCs can be preserved against the biodeterioration agents using antifungal pesticides (Verhey and Laks 2002; Morton et al. 2003; Simonsen et al. 2004), or using the essential oils (Xu et al. 2015; Salem et al. 2016a). A pretreatment of wood particles (cold or hot water extraction) is mainly used to improve the quality of the produced product in terms of mechanical, physical, and thermal stability properties. It is done to eliminate the wood extractives that cause some problems during the production of WPCs. For example, Nasser and Aref (2014) investigated the effect of an aqueous extraction on the performance and properties of wood/polypropylene composites made from P. dactylifera, Juniperus procera, Conocarpus erectus, and Tamarix aphylla. They reported that pretreating the wood particles with either cold or hot water resulted in significant improvements in the compatibility of each wood species with polypropylene without adding coupling agents. However, the effect of these pretreatments on the fungal resistance of the produced WPCs has not been studied yet. Although no studies have been performed on the fungus resistance of WPCs made from pretreated particles of date palm midrib, Nasser and Aref (2014) found that the physical, mechanical, and dimensional stability properties of the produced WPC panels had been improved. Therefore, the objective of this study was to investigate the effects of particle pretreatments using hot water (70±5 °C) and cold-water (27±5 °C) extractions on the biodeterioration of wood-plastic composites made from the date palm midrib (P. dactylifera) by T. harzianum T6776. 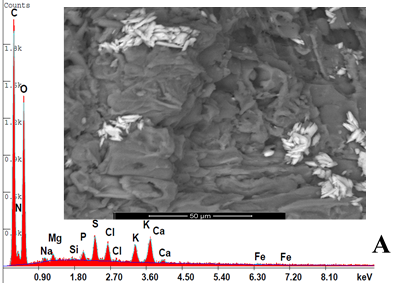 A surface-elemental analysis of the T. harzianum-inoculated and un-inoculated WPC samples was performed using dispersive X-ray spectroscopy (EDX). The microbial growth on the wood surface was evaluated using an environmental scanning electron microscope (ESEM). In the present study, wood/polypropylene composite made by the melt-blending technique from the midrib of date palm without leaflets was used. The wood-plastic composite (WPCs) panels were manufactured from polypropylene without coupling agents or untreated particles, including particles pretreated using either cold or hot water extraction. Table 1 presents the information about the pretreatments and the manufacturing characteristics of the studied WPCs. Other properties, such as mechanical and dimensional properties, were evaluated in the previously published work (Nasser and Aref 2014). The WPC samples with standard dimensions of 2 × 2 cm2 were prepared at a sawmill workshop, Faculty of Agriculture, Alexandria University, Alexandria, Egypt. The samples were conditioned at 25 °C ± 3 °C and 65% ± 5% RH for about two weeks prior to the incubation process to reach the equilibrium condition. The WPCs made from untreated date palm and polypropylene without maleic acid modified polypropylene “MAPP” (DP-UN-PP), date palm pretreated by cold water extraction and polypropylene without MAPP (DP-CWE-PP), and date palm pretreated by hot water extraction and polypropylene without MAPP (DP-HWE-PP) were used (Nasser and Aref 2014). The two aqueous extraction pretreatments (hot or cold water) were used to enhance the performance and compatibility between the date palm and the PP (Nasser and Aref 2014). Also, it should be noted here that the boiling water was changed every 2 h to remove the soluble extracts, and also the date palm midrib fronds were dried at 80±5 °C for 18 h to avoid the formation of undesirable foams that arise from the wood moisture and any discoloration that may occur from charring of the extracted materials. 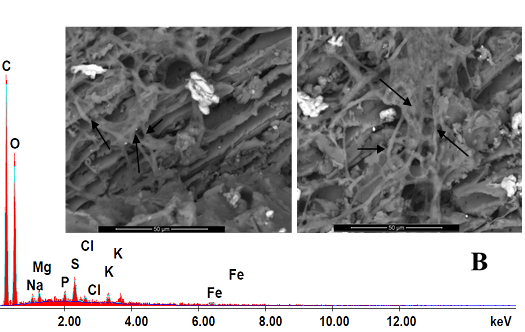 In continuing research, the authors used a temperature of 70±5 °C for the hot water extraction of extractives, mainly free sugars, starch, and lipids. In contrast, the use of high temperature resulted in increasing the mass loss of the target product, where the concentration of acetic acid generated from the cleavage of acetyl groups of hemicellulose increases with increasing temperature (Hosseinaei et al. 2011a). In addition, cold-water extraction was used fundamentality to compare with hot-water extraction of the particles, since it was stated that the amount of extractives in hot water is higher than those from cold-water extraction (Moslemi et al. 1983; Sunagawa et al. 2000; Nasser 2014; Nasser and Aref 2014). The WPC block samples (2 × 2 cm2) constructed from date palm midrib (DP-UN-PP, DP-CWE-PP, and DP-HWE-PP) were subjected to fungal inoculation by Trichoderma harzianum T6776 (supplied from Regional Center for Mycology and Biotechnology, Al-Azhar University, Cairo, Egypt). The spore inoculum was prepared by growing T. harzianum on a Czapek-Dox medium for 7 days at 30 °C, and spores were harvested aseptically using 10 mL of sterile 0.01% (v/v) Tween 80 solution, followed by spreading of the spores using a camel hairbrush (El-Refai et al. 1995). Subsequently, the suspension of spores was filtered through muslin and standardized to a final concentration of 1.2 × 106 spores/mL using a hemocytometer. The WPC block samples were separately surface-inoculated with the spore suspension of T. harzianum. The weight loss (WL) after 2 months of incubation (Mansour and Salem 2015, Mansour et al. 2015; Salem et al. 2016 a,b) expressed by a percentage for each WPC specimen, was determined as the difference in the weight of a specimen after initial conditioning, i.e., prior to inoculation with T. harzianum and after two months of incubation (Schirp and Wolcott 2005). Colonization and degradation of the WPC surfaces was evaluated two months after the inoculation and compared with the un-inoculated samples (control). An SEM (FEI Quanta 250 SEM FEG, FEI Company, Eindhoven, Netherlands) was used to study the hyphal growth of T. harzianum on the WPC surfaces. An electron dispersive X-ray (EDX) spectroscope attachment was used to measure the changes in the elemental chemical compositions of the inoculated and un-inoculated WPCs (Danilatos and Robinson 1979). The fungal colonization was visually evaluated after 2 months and 4 months of inoculation. The extent of fungal growth was assessed by the naked eye as stated by Salem et al. (2016 a, b). A one-way analysis of variance (ANOVA) was used to determine if there were significant differences in weight loss between the un-incubated and incubated WPC samples. This was followed by least significant difference tests (LSD) to identify which material or treatment averages were different. In addition, the data of quantitative elemental results were analyzed with ANOVA followed by a LSD test for comparison. The ANOVA was performed on SAS Institute software (Version 9, SAS Institute Inc., Cary, NC, USA), with probability set at 0.05 (P < 0.05). Table 2 presents the weight loss (WL) data for the WPCs inoculated with T. harzianum. A negative and significant (P = 0.0109) WL (-5.430%) was observed for the WPCs made from DP-UN-PP and inoculated with T. harzianum after 2 months. The WL results indicated that the pretreatments of date palm particles reduced the growth of T. harzianum in comparison with the control and untreated particles. Previous studies have shown that fungi could cause WL in WPC with respect to only the wood fillers (Albertsson and Karlsson 1988; Iiyoshi et al. 1998; Fabiyi et al. 2011). The weight gain in DP-UN-PP, DP-CWE-PP, and DP-HWE-PP could have been due to the hysteresis effect, which was previously reported as a common source of error in wood decay experiments (Zabel and Morrell 1992). The determination of WL in WPC may have been affected by a lack of complete MC equilibration of specimens (Schirp and Wolcott 2005). Another explanation is that the weight gain could have been due to huge growth of fungal hyphae over and inside the WPC samples. 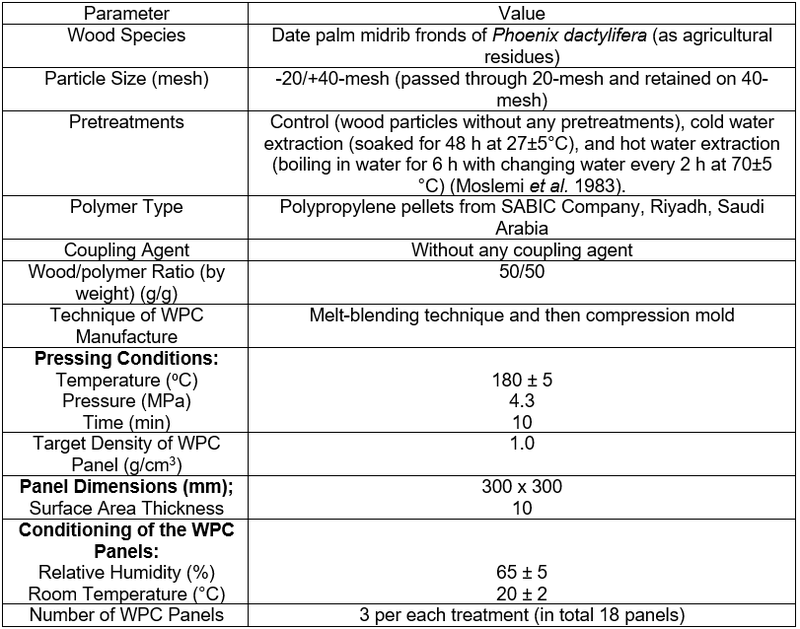 The overall significant changes in the surface elemental compositions analyzed by EDX of WPCs made from frond midrib of date palm and polypropylene without MAPP, untreated (DP-UN-PP), pretreated with cold-water extraction (DP-CWE-PP), and pretreated with hot-water extraction (DP-HWE-PP), inoculated and un-inoculated with T. harzianum are shown in Table 3. The Carbon element peak decreased by a significant (P < 0.0001) amount from 49.23% to 40.97% when the WPC samples were made from DP-UN-PP and inoculated with T. harzianum. These results were in accordance with the findings of a previous study (Mansour and Salem 2015). In contrast, the oxygen content increased from 32.69% (control) to 39.52% (DP-UN-PP with T. harzianum). Furthermore, the valuable N-content (5.56%) in the control samples was completely consumed by T. harzianum in the inoculated sample of WPC made from DP-UN-PP. S and the Ca increased significantly (P < 0.0001) from 3.19% and 3.41% in the control treatment to 5.75% and 7.12%, respectively, in the samples inoculated with T. harzianum. The P content decreased significantly (P < 0.0001) from 1.46% to 0.79%, while Cl increased with a significant (P < 0.0001) amount from 0.94% to 1.34%. Moreover, the Si peak was not observed in the control sample, but it appeared in the inoculated WPC made from DP-UN-PP by T. harzianum in the amount of 1.20%. The C element peak measured in the WPC surface made from DP-CWE-PP was not significantly (P > 0.05) affected, and decreased by a negligible amount from 53.64% in the controls to 53.44% when inoculated with T. harzianum for two months. The changes in the element peak of O also were not significant (P > 0.05), as the value of WPC of DP-CWE-PP inoculated with T. harzianum increased to 39.10%, compared with the control (37.96%). The results showed that T. harzianum had consumed small amounts of Ca (1.51%) and Si (0.30%) compared to the control. The P peak was observed in the inoculated WPC made from DP-CWE-PP with a small amount of 0.69%. Small changes in the concentrations of elements like Na, Mg, S, Cl, K, and Fe were found. In the WPCs made from DP-HWE-PP, the C content increased significantly (P < 0.0001) from 43.82% to 46.21% when affected by T. harzianum. This could have been related to the pretreatment used. In addition, the O content did not change significantly (P > 0.05), apparently rising from 38.12% to 38.52%. Furthermore, the high amount of N (7.88%) was partially consumed and decreased significantly (P < 0.0001) to 6.84% in the WPC made from DP-HWE-PP. In WPC made from DP-HWE-PP and inoculated with T. harzianum. The Si and Cl peaks increased significantly (P < 0.0001) from 0.23% and 1.54% in the control to 1.83% and 1.84%, respectively. In contrast, the S, K, and Ca concentrations decreased significantly with probability values of P < 0.0001, P = 0.0018, and P < 0.0001, respectively, from 1.99%, 1.92%, and 2.90% in the control to 0.53%, 1.09%, and 1.52%, respectively, in the inoculated WPC with T. harzianum. In comparison with the control (Fig. 1), an intensive growth of T. harzianum hyphal mat was found over the surface of WPC constructed from DP-UN-PP, with the colonies clearly visible and covering the deteriorated WPC surfaces. The conidia are mostly globose and developed on phialides produced in the opposite direction at each point (Rahman et al. 2011). 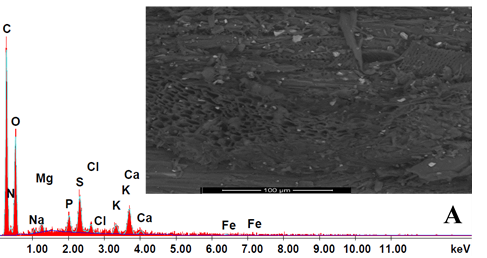 Figure 2 presents the SEM-EDX graph of WPCs made from date palm pretreated by cold-water extraction with polypropylene (DP-CWE-PP), and uninoculated with T. harzianum. 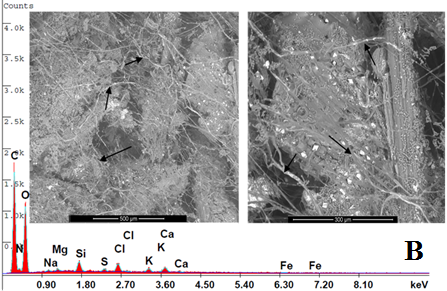 The elemental analysis (Table 3) of the WPCs made from DP-CWE-PP showed that there were negligible changes in the amounts of C, O, Na, Mg, S, Cl, K, and Fe between the control and the specimens inoculated with T. harzianum. Figure 2B shows a small growth of T. harzianum hyphal over the WPCs surfaces (DP-CWE-PP). Even in comparison with the control (Fig. 3A), the C element increased in the WPC made from DP-HWE-PP, but the biodeterioration by T. harzianum occurred (Fig. 3B), which could have been related to the partially consumed N. In addition, the hyphal growth of the T. harzianum was seen over the surfaces of the inoculated WPC samples. In this study, T. harzianum grew well over the WPCs made from date palm midribs and metabolized the carbon of wood by producing large hyphae (target-oriented and branched), especially in the WPCs made from untreated particles. These results could be related to the high concentration of sugar in the particles, as well as other wastes from date palm (Alrumman 2016). After the treatments with cold or hot water, the sugar could have been removed, this resulted in the reduced growth of T. harzianum. The soluble amount of extractives, mainly sugars in hot water and cold-water extraction, were 21.65% and 15.28%, respectively (Nasser and Al-Mefarrej 2011; Aref et al. 2013). In addition, with different varieties of date palm, the total extractives’ contents ranged from 19.3% to 21.7% and ash contents ranged from 3.3% to 5.8% (Nasser 2014). The cellulose content ranged from 42.93% to 45.74%, hemicellulose content from 24.90% to 29.93%, and lignin from 25.82% to 30.09% (Hindi et al. 2010; Nasser and Al-Mefarrej 2011; Nasser 2014). The hot water extraction of hemicellulose at a high temperature could decrease mold susceptibility (Kim et al. 2008, 2009; Hosseinaei et al. 2011b, 2012), where the present treatments (cold (27±5 °C) or hot water “70±5 °C” extraction) eliminated extractives, such as free sugars, starches, and lipids, that can serve as food for fungi. Furthermore, the removal of free sugars, starches, and lipids, may explain the mold resistance of the WPC made with hemicellulose extraction at high temperature by hot water extraction (Hosseinaei et al. 2012), but the amount of extractives extracted by cold water is lower than those from hot water extraction of the particles ((Moslemi et al. 1983; Sunagawa et al. 2000; Nasser 2014; Nasser and Aref 2014). Means with the same letter within the same row are not significantly different at 0.05 level of probability according to Fisher’s Least Significant Difference; Values are the mean of three replicates ± standard deviation. The related studies showed the effects of a hot water extraction of particles on the properties of the manufactured wood-based composites (mechanical, physical, and thermal properties, as well as mold resistance). For example, using high temperatures, such as 140 °C, 155 °C, and 170 °C, caused degradation in the main chemical components of the wood (hemicellulose) and suggested that water and mold resistance of WPC could be improved (Kim et al. 2008, 2009; Hosseinaei et al. 2011a, 2012). The visual observations of the inoculated WPCs with T. harzianum in comparison with the control were recorded at 2 months from the inoculation and at 4 months of storage of Petri dishes at room temperature, as shown in Fig. 4. After 4 months, the WPC samples made from the untreated date palm and polypropylene were fully covered by T. harzianum (DP-UN-PP); also, some growth was found over the WPCs made from the pretreated date palm with hot water extraction (DP-HWE-PP). 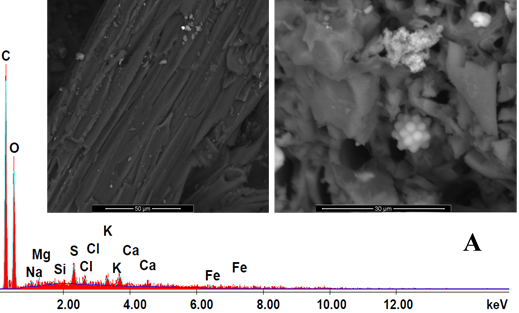 The SEM-EDX images of WPCs made from the pretreated wood particles with either cold or hot water extraction showed a significant growth increase of harzianum. 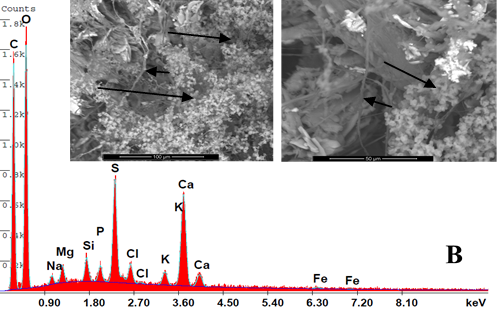 Particles of date palm pretreated with either cold or hot water at 70±5 °C improved the resistance against the mold growth of harzianum, where the SEM-EDX measurements showed some changes in the elemental composition as well as fungal invasion. After 4 months, the WPC samples made from untreated date palm and polypropylene (DP-UN-PP) were fully covered by harzianum. The authors would like to extend their sincerest appreciation to the Deanship of Scientific Research at King Saud University [Research Group Project # RGP-VPP-226] for the funding of this research. Bech-Andersen, J., and Elborne, S. A. (2003). “Moulds and indoor climate in Denmark,” in: International Research Group on Wood Preservation, Stockholm, Sweden IRG/WP/03e10488, pp. 1-9. Bruce, A., and King, B. (1986). “Biological control of decay in creosote treated distribution poles-II. Control of decay in poles by immunizing commensal fungi,” Mater. u. Organ. 21, 165-179. Green, F., Kuster, T. A., and Highley, T. L. (1996). “Pectin degradation during colonization of wood by brown-rot fungi,” Recent Res. Devel. Plant Pathol. 1, 83-93. Hindi, S. S., Bakhashwin, A. A., and El-Feel, A. (2010). “Physico-chemical characterization of some Saudi lignocellulosic natural resources and their suitability for fiber production,” JKAU: Met., Environ. Arid Land Agric. Sci. 21(2), 45-55. Khristova, P., Kordsachia, O., and Khider, T. (2005). “Alkaline pulping with additives of date palm rachis and leaves from Sudan,” Bioresour. Technol. 96(1), 79-85. DOI: 10.1016/j.biortech.2003.05.005. Kim, J. -W., Harper, D. P., and Taylor, A. M. (2008). “Effect of wood species on water sorption and durability of wood-plastic composites,” Wood Fiber Sci. 40(4), 519-531. Kim, J. -W., Harper, D. P., and Taylor, A. M. (2009). “Effect of extractives on water sorption and durability of wood-plastic composites,” Wood Fiber Sci. 41(3), 279-290. Morris, P. I., and Cooper, P. (1998). “Recycled plastic/wood composite lumber attacked by fungi,” Forest Prod. J. 48(1), 86-88. Morton, J., Quarmley, J., and Rossi, L. (2003). “Current and emerging applications for natural and woodfiber composites,” in: Proceedings 7th International Conference on Wood Fiber-plastic Composites, Madison, WI. Moslemi, A. A., Garacia, J. F., and Hofstrand A. D. (1983). 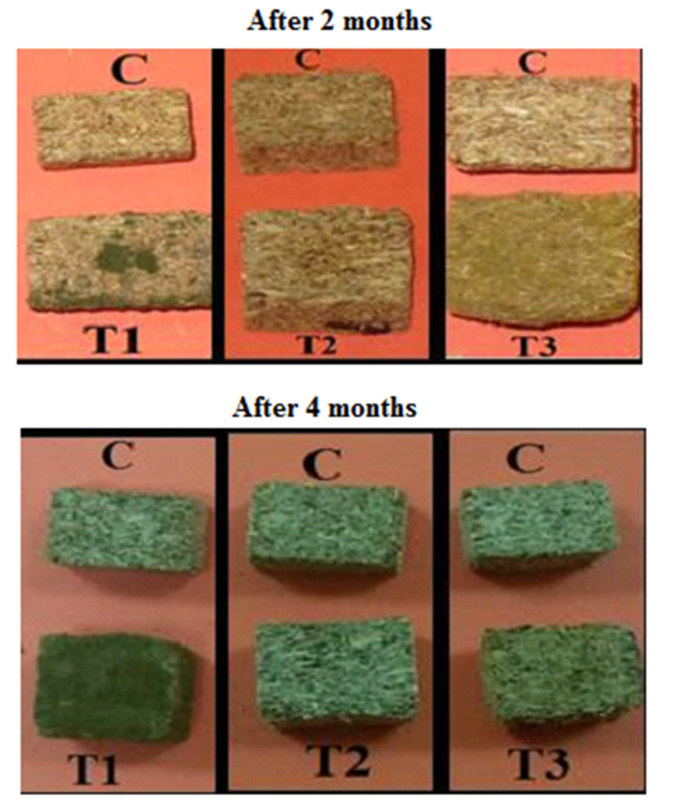 “Effect of various treatments and additives on wood-portland cement-water-system,” Wood Fibre Sci. 15(2), 165-176. Nasser, R. A. (2014). “An evaluation of the use of midribs from common date palm cultivars grown in Saudi Arabia for energy production,” BioResources 9(3), 4343-4357. Naumann, A., Stephan, I., and Noll, M. (2012). “Material resistance of weathered wood-plastic composites against fungal decay,” Int. Biodeterior. Biodegrad. 75, 28-35. DOI: 10.1016/j.ibiod.2012.08.004. Pendleton, D. E., Hoffard, T. A., Adcock, T., Woodward, B., and Wolcott, M. P. (2002). “Durability of an extruded HDPE/wood composite,” Forest Prod. J. 52(6), 21-27. Râpă, M., Popa, M. E., Cornea, P. C., Popa, V. I., Grosu, E., Geicu-Cristea, M., Stoica, P., and Tănase, E E. (2014). “Degradation study by Trichoderma spp. of poly (3-hydroxybuthyrate) and wood fibers composites,” Romanian Biotechnol. Lett. 19(3), 9390-9399. SAS Institute Inc. (2001). “SAS/Stat User’s Guide,” Version 9, SAS Institute Inc., Cary, NC. Schirp, A., and Wolcott, M. P. (2005). “Influence of fungal decay and moisture absorption on mechanical properties of extruded wood-plastic composites,” Wood Fiber Sci. 37(4), 643-652. Shah, S., Nasreen, S., and Sheikh, P. A. (2012). “Cultural and morphological characterization of Trichoderma spp. associated with green mold disease of Pleurotus spp. in Kashmirm,” Res. J. Microbiol. 7(2), 139-144. DOI: 10.3923/jm.2012.139.144. Simonsen, J., Freitag, C. M., Silva, A., and Morrell, J. J. (2004). “Wood/plastic ratio: Effect on performance of borate biocides against a brown rot fungus,” Holzforschung 58(2), 205-208. DOI: 10.1515/HF.2004.031. Sunagawa, M., Horisawa, S., Tamai, Y., Matsuoka, Y., Miura, T., and Terazawa, M. (2000). “Biodegradation of Non-lignocellulosic Substances III Effects of hot- and cold-water extractives of sawdust on bacterial multiplication,” Research Bulletin of the Hokkaido University Forests 57(1), 66-70. Verhey, S., and Laks, P. (2002). “Wood particle size affects the decay resistance of woodfiber/thermoplastic composites,” Forest Prod. J. 52, 78-81. Verhey, S., Laks, P., and Richter, D. (2001). “Laboratory decay resistance of wood fiber/thermoplastic composites,” Forest Prod. J. 51(9), 44-49. Viitanen, H., and Ritschkoff, A. (1991). Mould Growth in Pine and Spruce Sapwood in Relation to Air Humidity and Temperature (Report No. 221), The Swedish University of Agricultural Sciences, Department of Forest Products, Uppsala, Sweden, pp. 40, +9. Zabel, R. A., and Morrell, J. J. (1992). “Wood microbiology: Decay and its prevention,” Academic Press, San Diego, CA, United States, Inc., pp. 476. Article submitted: February 5, 2017; Peer review completed: April 6, 2017; Revised version received and accepted: April 13, 2017; Published: April 20, 2017.